Automatic wallpaper changer with many other functions. Multilanguage support: English, French, German, Spanish and Russian languages. Do you often look for wallpaper calendar here and there? Or make it yourself by some professional image tools with hard work? Now PlainSight Desktop Calendar makes things easy. It offers great looking calendar which can be full integrated with your favorite wallpaper. You can define its position, font, color, size, transparency just by a few clicks. For getting best user experience, it uses anti-aliased font. PlainSight Desktop Calendar is not only a great looking calendar but also a useful tool. It can get data from Outlook and display them on the desktop. It supports recurrence pattern for appointments and can display different status of tasks. Double click the appointment window or task window will auto open the data with Outlook. You can create, edit, delete and change data status easily. Weather forecast is another useful feature. It can get 7-day weather forecasts from National Weather Service. More than 8000 cities in US are covered. When you move mouse to calendar, all the information of a day (weather, appointment, holiday, etc) shows in plain sight. Screen Calendar for Outlook really allows you to put the calendar on your desktop wallpaper choosing the calendar size and transparency. Double-click a calendar to schedule your business day. To read your records fully, just move your mouse over the date cell. Also, your records and calendar can be printed. So, your PIM is always at hand (it runs in system tray), but it does not require much space, especially if you like to use the hide/show calendar commands. Screen Calendar for Outlook lets you to: choose any calendar size and place of your screen for active Screen Calendar for Outlook; set transparency of calendar; pick and note any dates and holidays by clicking on a calendar just (move mouse to read your dates notes on calendar); show half or whole the next month; select any skins and background images for your desktop or Winamp skins for calendar; set random background image from folder or image list; change backgrounds with any time period; choose the custom type of a calendar representation; create calendars using any color styles suitable for you; show or hide calendar; show weeks numbering; customise holidays default; organize your desktop icons variously; show the current date on the system tray icon; mark the dates with notes; postpone the records to next or another day; print the calendar and notes; save calendar with background or background image; remind and repeat records; see contrast calendar over any background; dual-monitor supporting: active calendar on every monitor; schedule business day in the MS Outlook. Screen Calendar for Outlook is fully customizable. The program interface is easy and friendly. ThreeDim Desktop performs in 3D environment as the set of 3D objects the following: Windows Desktop; Windows Explorer; eMule; NeoNapster; SoulSeek; Turbo Torrent; Xolox; WinRAR; WinAmp; XP Firewall Control; ThreeDim Desktop also animates the cursor movement results and provides three-dimensional lights in the three-dimensional scene. 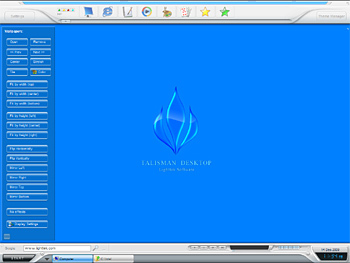 Talisman Desktop is a desktop manager and shell-replacement for Windows 9x/ME and NT/2000/XP. The program lets users design their own desktops and interfaces or choose from hundreds of downloadable themes, which work either atop or as complete replacements for the default Windows shell. Unlike Windows XP themes, Talisman Desktop lets you completely customize the Windows interface. Its power extends from adding new toolbars to designing a brand-new desktop with any combination of drop-down menus, buttons and panels. 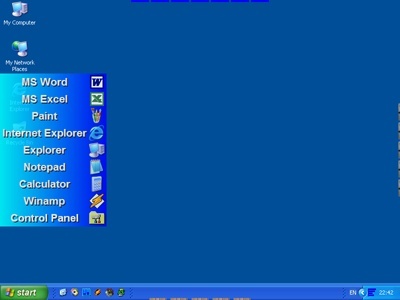 The program allows any number of fixed or free-moving icons, buttons, or other objects that launch programs, Web sites, or internal shell commands; HTML and Flash objects; a customizable taskbar, system tray, calendar, clock; and customizable Start, folder, and task menus, as well as a powerful script language and plugins. Originally created for home users who enjoy outdoing the Mac OS or "Longhorn" designers, Talisman has also been adopted as a front-end interface for public and corporate PCs and kiosks. Currently, there are over 1000 customizable themes (interfaces) that can be used for personal PCs, standardized corporate desktops, car PCs, Home Theater and MediaCenter interfaces, touch-screen computers, protected interfaces for museums, libraries and other organization. Icon Changer is a software application that makes changing icons on the desktop fun and easy. It is a hassle-free way to personalize your desktop without having to open up any computer manuals. Simply click the icon you want to change, point at the one you like and thats all. Change icons to make navigation easier, to group similar applications together, or merely to customize and spice up your desktop. Try it.